After three weeks off the harvest preparations are under way now. And we have great support this year. Besides Antoine who’s been working with us since April we now have Stephanie and Nick joining the crew – welcome guys! The first thing to do obviously was an extensive visit of all vineyards. Can you guess which variety I’m explaining on this pic? The last weeks of sun were tremendously helpful to prevent further Peronospora damage. There are still a few fresh infections here and there but it basically stopped. The heat should also be slowing down the growth of the drosophila suzukii populations. And it does of course give the ripening process a massive boost. Warm days and cool nights are just perfect. There is one “but” though. Too much heat leads to sunburn. 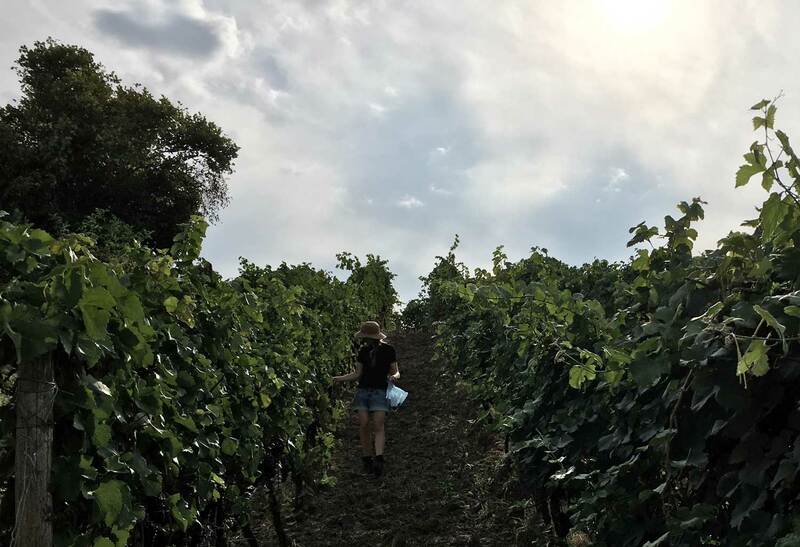 Because of the turbo-ripening-weather we started collecting samples from the early varieties: Regent, Müller-Thurgau, Bacchus, Schwarzriesling. With an average acidity of 12-15 g/l, pH below 3 and 60°-66° Oechsle (goal is 80°-85°) we’re getting closer to harvest every day. If it stays that sunny we might be able to start in two weeks time.